Winner of a Gold at the World Cheese Awards 2018 and a bronze award at the 2018 International Cheese Awards. 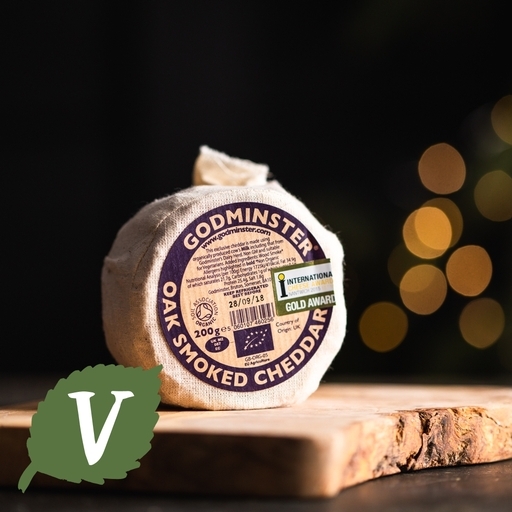 Award-winningly smooth and creamy vintage cheddar, cold-smoked over sustainable oak chippings for an incredibly rich depth of smoky flavour. Best eaten at a leisurely pace, alongside some moreish biscuits and a good glass of Merlot. No cheeseboard is complete without one. Keep in the fridge but remove an hour before serving – letting the cheese warm to room temperature brings out its flavour. Soon after going organic in 1999, Godminster realised that their milk would never generate enough to sustain the farm. They had an idea to make their own cheddar, so set to work with a traditional 70 year old recipe. The resulting vintage cheddar went down a storm at local farmers’ markets in Somerset and has won a raft of awards. This oak smoked variety is a new addition and, by our reckoning, is also an award winner. Read more about Godminster's dairy farm and cheesemaking here. Pasteurised cows milk, starter cultures, vegetarian rennet, salt* (1.8%).